Kiehl's since 1851 proudly announces it's 6th Annual Artist Collaboration for Holiday – introducing Kiehl's x Craig & Karl.Designed by International artist duo Craig & Karl, this limited-edition label is a kaleidoscope of vibrant color that will adorn some of Kiehl's most beloved customer favorites, including Kiehl's Creme de Corps, Creme de Corps Whipped and Ultra Facial Cream. 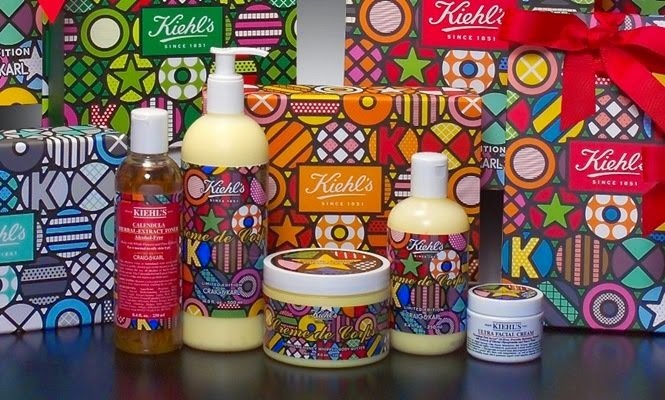 Evoking the celebratory nature of the holiday season and Kiehl's quirky, New York City-inspired spirit, the festive graphic print outfits Kiehl's Holiday items so beautifully that each serves as a unique, ready-made gift perfect for the season of giving. Based in different parts of the world, Craig in New York City and Karl in London, the internationally renowned pair are graphic artists who specialize in illustration and installation projects.Recognized for their portraits of mainly high-profile figures and celebrities, such as Jay-Z, Woody Allen, Lady Gaga and Karl Lagerfeld, both artists collaborate on a daily basis to create work that is bold, yet filled with simple messages that are often humorous.Craig & Karl have exhibited across the world and have collaborated with LVMH, Google, Nike, Apple, MCM and Le Specs, to name a few. Considered the most hydrating body moisturizer in the Kiehl's line, this super-enriched, nurturing body treatment is formulated with Beta-Carotene, Squalane and nurturing oils; ideal for extremely dry skin.Creme de Corps leaves skin soft, smooth and elegantly hydrated.The original, classic formulation and customer favorite for decades. Luxuriously scented cream – light on skin, yet rich in 24-hour hydration.Decadently air-whipped for instant penetration to restore, protect, and soften skin.Quickly absorbed to deliver deep moisturization and leave a light, addictive scent on skin. A light-textured daily hydrator that leaves skin comfortable and visibly well-balanced.Provides 24-hour hydration with continuous water replenishment throughout the day, leaving skin supple, particularly in harsh weather conditions.Helps reduce moisture loss while drawing and absorbing moisture from the air. In addition to Kiehl's individual offerings, customers have the option of customizing their own gift sets, personalizing their holiday gifting with the Kiehl’s products of their choice.